Each winter a small number of Burrowing Owls come to spend a few months along the eastern shoreline of San Francisco Bay. 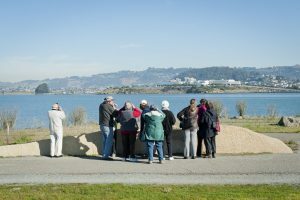 The owls have been observed in East Shore State Park, Cesar Chavez Park and the Tom Bates Sports Complex in Berkeley, at Martin Luther King, Jr. Shoreline Park in Alameda, and at a few other locations. Burrowing Owls are also found in the South Bay. The winter migrants come from breeding grounds as far away as Idaho, generally arriving in October and departing in March. The Golden Gate Audubon Burrowing Owl Docent Program educates the public about the owls and encourages their conservation and protection. This cooperative effort between the Golden Gate Audubon Society, the City of Berkeley Marina and the Shorebird Nature Center has been successfully implemented for the past six years. The Art Installation at the northeast corner of Cesar Chavez Park protects a few of the owls and has signage to educate the public. Each year Burrowing Owls are also found at several other locations along the North Basin shoreline including the McLaughlin Eastshore State Park and the Tom Bates Sports Complex. Protecting the over-wintering Burrowing Owls and encouraging their propagation. Educating the public about the presence of Burrowing Owls and the need to protect them and coexist with them. Encouraging the protection of grassland bird species. Helping these charismatic little owls stimulate public interest in bird conservation. Collecting data on Burrowing Owl numbers and their human visitors. The program requests that docents commit to working for an hour at a time, at least once every two weeks from October through March. Most docents actually spend at least two hours each time they serve, as time is required to walk to and from the site, and when possible the docents also survey the owls that are present at other locations along the North Basin. The docents are provided with training and tools so they are comfortable talking to the public, and feel knowledgeable about the owls and their situation. They are independent and make their own arrangements to work on their own or with a partner or friend. Binoculars, spotting scopes and other equipment are available as needed. The Burrowing Owl (Athene cunicularia) is a California Species of Special Concern, having been extirpated from much of its former habitat throughout the state, including the Bay Area. In fact, all over the western United States and Canada Burrowing Owls are counted among the grassland bird species that are slowly disappearing as their habitat is converted to farmland or housing. Most attention is paid to colonies of breeding Burrowing Owls. However, migratory owls that breed further north in areas where it snows need protection at both their breeding grounds and their wintering grounds, since they are unfortunately losing habitat at both ends of their migratory cycle. In the Bay Area, these over-wintering owls must compete with humans for desirable shoreline habitat. The Burrowing Owls need an over-wintering site that offers a safe place to rest on the ground next to a burrow that can be used for hiding from predators. The owls also need foraging grounds where they can catch their regular diet of insects and small rodents. The East Bay shoreline provides small patches of this essential habitat mix. The owls take over burrows from California Ground Squirrels, often in the rip-rap (the large rocks that line the shoreline). Currently, the only remaining breeding Burrowing Owls around the Bay reside in Mountain View Shoreline Park in the South Bay. Visit Chavez Park to see the owls and learn about their fragile coexistence with humans. Keep your dog on a leash where this is required, and encourage your friends to do the same. If you see a Burrowing Owl, do not approach it. Remain as far away as possible. Use binoculars, a spotting scope, or telephoto lens to see it better. Burrowing Owls conserve energy by staying put until the last minute. Don’t make it leave its safe resting spot just so you can get a good photo. 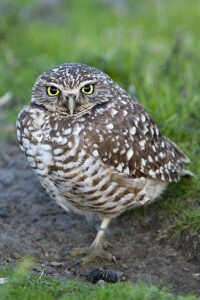 Become a Burrowing Owl Docent with the Golden Gate Audubon Society. Encourage the State of California Department of Fish and Game to increase protection for Burrowing Owls. Don’t use rodenticides (rat poison) — they can kill owls that eat poisoned rodents. If you observe an owl in trouble, call the Wild Bird Rescue Hotline at 1-866-WILD-911. If you observe a serious problem with a dog harassing an owl, contact the City of Berkeley Animal Shelter at 1-510-981-6600. See how Burrowing Owls can rotate their heads 270 degrees in this video shot in 2012 at Cesar Chavez Park by Dianne Fristrom.